With its four-side seal design, this side gusseted bag is given an even greater reinforcement to hold your heavier products. 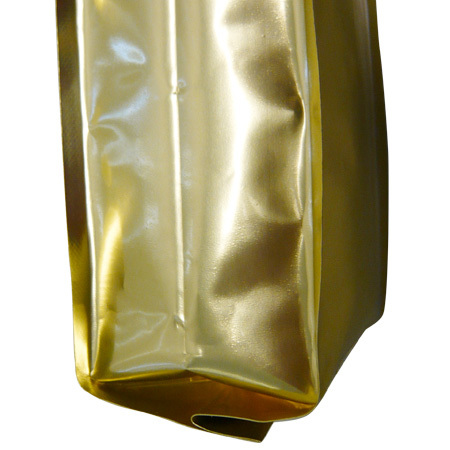 This innovative sealing style also allows the bag to hold its shape better on the shelf. With the seals on all four corners of the bags, the front and back panels remain smooth for label application. 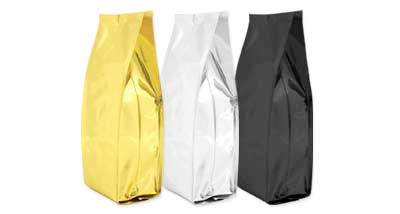 The aluminum foil used on these bags provides one of the best barriers available in the flexible packaging industry. It provides an excellent oxygen, moisture and aroma barrier for all products. Since its barrier qualities are so exceptional, it is being used in countless packaging applications. Valve and zippers are available on some of these bags. Detail picture of the quad seal. Click for larger picture.